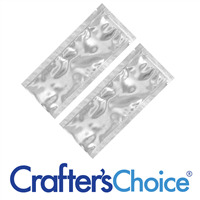 This Silver Packet is moisture and oxygen resistant. Once heat sealed it is safety sealed until your customer tears the top perforation. Holds approximately 1 fluid ounce. To Use: Fill packet with desired product. Carefully heat seal open end of bag with a household iron (medium setting) for 1-2 seconds. Label sample as desired. COMMENTS: I love these! I use them to send out lotion, liquid soap and mud mask samples. Easy to seal. I use a hair straightener to do the job. COMMENTS: I love this size for shampoo and conditioner samples. I have long hair so I know those tiny packets you often get aren't usually enough to even create a lather in my hair. COMMENTS: Perfect for sample and travel size lotions. Excellent product. Easy to use. Will purchase again. COMMENTS: I love these packets! They hold the perfect amount of products for samples and heat nicely as well. Very professional looking. COMMENTS: Oh my gosh, how did I live without these. These are SO perfect for small sample items of lotions, face masks, etc. Perfect and cheap while still being able to provide a "trial" to your customers. Thank you! "These are perfect for one time use face mask!" COMMENTS: I was a little worried about this product. I was not sure it was what I was really needing. It worked out perfect! Great size for one time use face mask. Easy to seal and stays sealed! Totally recommend. COMMENTS: These heat seal packets are great for packaging samples to mail out. When sealed properly, they don't leak. COMMENTS: Perfect... easy to use. Just what I needed to let customers pay for trying products out.. .they come back for the full size! COMMENTS: This little beauty has helped me tremendously in sampling and providing thank you gifts for customers' orders. Easy to work with. Make sure you iron is on the lowest setting for a nice smooth finish. COMMENTS: Perfect size for bulky body scrub samples. COMMENTS: I dislike schlepping bottles of lotion and body wash for several reasons - bottle opens in my purse, when traveling into and out of altitude my bottles leak or worse, pop open! But most of all when flying - I have to check my bag. But with these hand pouches, I and my customers no longer need to worry about mishaps! By the way the sealing is the best part for me - I use a skinny flat iron (for hair)to seal them instead of a big clunky iron. NO MESS! • Nothing - it's perfect! COMMENTS: I am so impressed on how these look. They make my samples so professional and so easy to use! I came up with such an easy process to fill them. I went to my friendly pharmacy and got several syringes (the ones you use for liquid meds) and just filled them to the weight I wanted for the sample and just squeezed the product in. There was no mess, since you can really get the syringe to the bottom. You only need the large syringe (no needle). Try it it's great. COMMENTS: I like this packet because it is enough room to put products in without struggling with a small opening. It also allows customers a generous amount of product to enjoy and see a difference of how the product benefits them. I can put a nice colorful label that is not too small. It offers a dependable seal, no leaking. COMMENTS: I use these for trial packets for my products. I use a hair straightener to close the end as I find it to be much easier to use verses an iron especially with liquid products. "Awesome sauce... I mean soap!" COMMENTS: This soap base was the first I have ever purchased online. I had bought some from the major retail stores however they always seem to be sticky, dry, or just plain difficult to work with. I found that this base is just what I needed.I use the double boiler method to melt my formulations and they do so quickly and evenly. Thanks WSP! "PERFECT for travel size shampoos, conditioner, etc"
COMMENTS: I use these professional looking little packets in a varied larger sampler of my products... I love the seal, ease of use, professional appearance. COMMENTS: I am currently using this for my travel gift sets that include shaving cream, lotion, and scrubs. It took me one or two tries to get them closed properly but after that it was so easy! I highly suggest not over filling the bags. (I did with my shaving creams and it was messy.) I will continue to use these for travel sets and samplers over the course of the year. "Would this be suitable to use for single-use face masks or hair masks? My masks usually have the consistency of a thick lotion or hair conditioner. I'm looking for something like this for individual use because larger jars will eventually dry out my product (especially the clay face masks). " Staff Answer Yes, these packets are perfect to use for single-use masks. "What size labels do we use for this product?" Staff Answer The label area is approximately 2.5" x 3". "How many grams of powder can fit into these packets? Want to use them for my company's pre workout samples. 15.5 g per scoop"
Staff Answer We added approximately 2.5 teaspoons of powder and this left enough room to seal the packet. This would equal 12.5 grams. "Can I use a bag sealer on these bags? " Staff Answer Yes, that would work fine in sealing these packets. "Are these $0.95 each (for one)?" Staff Answer Yes, these are $0.95 each but you can receive a better discount if purchasing a set of 50 or more. "are these packets food safe?" Staff Answer We have heard of customers using these to package tea blends, spices, etc. "how much dry product can these hold?" When creating our Chocolate Face Mask we determined that 3 tsp of the powder best fits in this Heal Seal Packet.